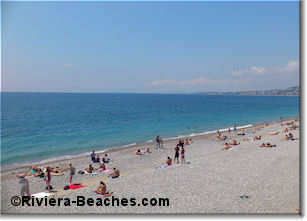 Opera beach, named after the nearby Nice Opera House, is between Beau Rivage and Ponchettes beaches. It contains both a wide public beach and the private Opera Plage beach-restaurant. As the pedestrian Quai des Etats-Unis is wider here and traffic lanes are fewer, the sound of whizzing cars is noticeably absent. There may be the sound of whizzing boats though as the nautical activities of Nikaia Glisse get into gear. There's parasailing, kayaking, waterskiing and wakeboarding. 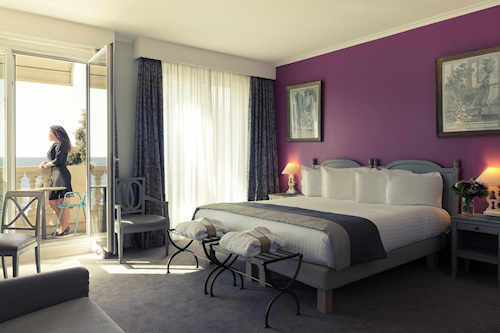 Opera beach is just across from the four-star Mercure Nice Marché aux Fleurs. Opera Plage has full facilities for clients and there's a portable toilet during the summer. Otherwise, walk west a block for public toilets and showers at Beau Rivage beach. You can have lunch at Opera Plage or head into the Old Town across the street to sample one of the cafes on Cours Saleya where you can also buy picnic supplies. The closest bus stop is Albert 1er, several blocks west of the beach. There you'll find buses 8, 11, 52, 59, 60, 70, 94, 98, 200, 230, 400, 500. There's no lifeguard on duty at Opera public beach but there's one to the east and west at Centenaire and Beau Rivage. See more about lifeguards. Opera Plage is a quiet no-fuss beach-restaurant that is one of the oldest establishments on the Promenade. The sole concession to luxury is the masseuse you can book for a beachfront rubdown. The lounge chairs are either padded or adorned with mattresses. Opera Plage is one of the most reasonably priced beach options which is why I've selected it as the best beach on a budget. See more about private beaches and beach-restaurants. It's so important to revisit a place. Yesterday was a chilly spring day but the intervals of sunshine encouraged an outdoor lunch. Opera Plage was busy, maybe a little too busy. The reservation I made yesterday disappeared from the records apparently even though we had called this morning to change the time. The server seemed overwhelmed. Were they shortstaffed? He made it clear that he barely had time to take the order as we hurriedly tried to communicate we wanted the fish of the day, water and glasses of rosé. He brought a bottle of water and when we said something about a carafe, muttered that it was already rung up. Ka ching! The grilled loup was delicious--no fault there--and the sides of roasted potato and vegetables were also tasty. 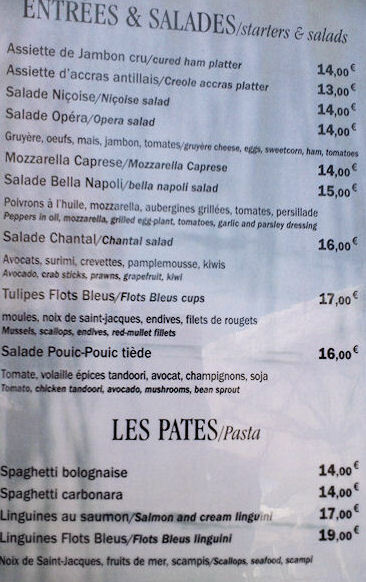 The fish was smallish however and, when the bill came, we gulped at the price of €7.50 for each small glass of rosé. We left with the unpleasant sensation of having paid more than the meal was worth. Jeanne 30 March 2015.